Amy Maples has been in love with Tony Black since she was six years old. A clandestine relationship with him the summer before she left for college ended in tragedy and she shut him out. Since then, they have been friends only. With a new job offer that will require her to move out of the country for a couple of years, she is determined to try one last time to rekindle their relationship. When the planned seduction does not succeed, she accepts the job in Australia, hoping that the tie away will be enough to help her get over Tony. Tony Black has been in love with Amy for over fourteen years. When Amy shut him out, he was completely devastated and devoted his energy to building his surfing career and loving her from a distance. He would rather be in her life as a friend than risk losing her completely. When he finds out that Amy has accepted the job outside the country, he regrets his rejection of her. Amy buried the pain from the past loss and never gave herself and Tony a chance to grieve and heal from the tragedy, one which still stands in the way of their second chance, but with the support and encouragement of their friends, Amy and Tony go on a journey of healing. The first half of the book was emotionally charged as Amy and Tony unburied all the issues that had been unresolved for years, including the issues with their fathers that summer and their effect on the choices they both made. Amy started out quite unlikable but redeemed herself as the story went on. The antics of their friends added humor to their heartbreaking story and the girls’ traditions were endearing. SEASIDE SECRETS is a wonderful and sweet second-chance story, strengthened by bonds of friendship and connections . Thank you for hosting SEASIDE SECRETS! Melissa Foster recently posted: Flirting with Love Release Day Celebration! 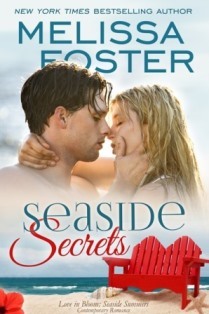 I enjoyed reading Seaside Secrets and especially Amy’s character growth! I’m looking forward to the next book!